$600 for up to 4 shooters on a 4 hour trip and only $75 more per each additional person(s). My boat holds 8 comfortably. All bowfishing packages include equipment (let me know if you are a lefty or righty) & fish cleaning. Hunts can be day, night or both. Trips can be extended at customers request! I hunt anywhere in Texas. This trip is often a numbers shoot just like the 8 hr trips but WITHOUT any alligator gar opportunities. We will be going after all other gar species as well as common carp, grass carp, buffalo, tilapia, and many other types of fish. 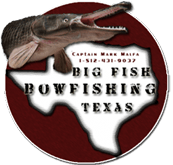 This trip would be great for the individual or individuals that just want to experience the excitement of bowfishing.